If you liked Predator, the movie, and have a passion for scuba diving, this irregular massive watch might be perfect for you. The well known luxury brand Jacob & Co. created a product that will fit on those that travel a lot. 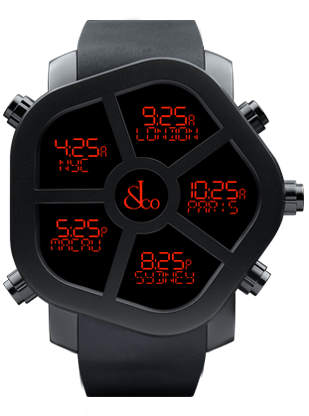 The watch can display five timezones at the same time. With a pentagon shape, the watch has stainless steel and Black PVD Finishing materials. The available display colors are red, orange, yellow, green, blue, purple and white. Jacob & Co. signed a contract with Cristiano Ronaldo. The well known Portuguese soccer player is the face of the Ghost watch. Jacob Arabo Founded Jacob & Company. At the age of 14, Arabo emigrated with his family from the former Soviet Union republic of Uzbekistan to United Stated.